Valued for their tidy turning radius, fuel efficiency and ability to park just about anywhere, subcompact cars are a popular vehicle class. Peppy and smoothly aerodynamic, the Versa is Nissan's popular four-door subcompact sedan, offering drivers all the perks of a much larger car in a small and appealing package. 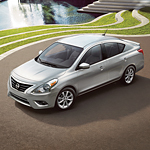 The Versa's 1.6-liter engine commands 109 horsepower and 107 pound-feet of torque, offering up to 39 mpg on the highway and 31 mpg around town. Drivers have an option of a five-speed manual transmission or one that uses Xtronic CVT technology to shorten gear ratios, delivering a performance that's similar to an automatic transmission. The CVT transmission also delivers more power on initial acceleration and improves fuel efficiency. The front suspension also receives an upgrade, mimicking high-end luxury cars with a response damper that eliminates the shock from bumps on the road and delivers a smooth ride on a variety of surfaces.